‘The right to guide the course of world history is the noblest prize of victory… I hope—indeed I pray—that we shall not be found unworthy of our victory if after toil and tribulation it is granted to us’. To honour the great statesman’s inspirational oratory and courageous leadership, the Winston Churchill Life and Times Collection showcases five new portraits of Churchill together with some of his stirring phrases that galvanised the nation during her darkest hour. Each coin in the collection is individually named, referencing some of Churchill's most memorable speeches. Struck in 2015 to mark the 50th anniversary of his death, the original collection sold-out very quickly. By popular demand, we are delighted to reissue the five coins – this time beautifully layered in 18-carat rose gold. You may own the first coin in the Winston Churchill Set for just £9.95, a £20.00 saving on the normal price. This coin is individually numbered, ensuring that it is completely unique to you. Each of the remaining four coins in the set are fully layered in Rose Gold and accented in pure 24 carat Gold, each coin may be yours for just £29.95 each. You will receive each coin at monthly intervals, starting with the Rose Gold Layered, Uniquely Numbered crown at the discounted price of £9.95. NOTE: The first coin in the collection, “We Shall Never Surrender” has been individually numbered, ensuring that your collection will be absolutely unique. Struck in solid bronze and layered in beautiful Rose Gold, each coin is struck to an exceptional Brilliant Uncirculated finish. Each portrait depicts Churchill in a different pose, from his defiant cigar-in-mouth 'V' for victory signal to the determination of the elder-statesman to achieve a lasting peace. The reverse features Ian Rank-Broadley’s iconic portrait of Her Majesty Queen Elizabeth II, who became our monarch when Churchill was Prime Minister. The five crowns in the collection will be supplied with the official Collector Presentation Folder, which protects, stores and displays your commemoratives. The folder includes Certificates of Authenticity guaranteeing the provenance of each coin. Together they provide important historical background information about Sir Winston Churchill and guarantees the coin specifications and edition limitation. Normally £2.95, it is yours FREE of charge. This stunning collection recalls Britain’s Darkest Hour and honours the life of the man who brought us safely through these dangerous years to a victory that few thought possible when he became Prime Minister. Each of the five coins pays tribute to Churchill’s great oratory, words which inspired our nation and the world during the darkest hours of WWII. 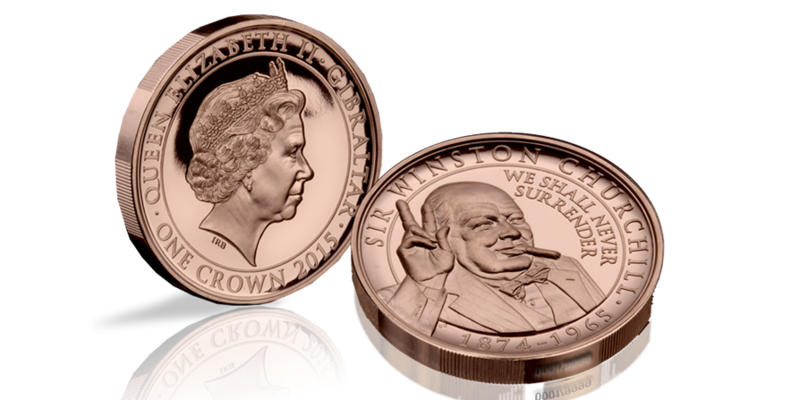 Click below to order your Rose Gold layered limited edition Churchill Life & Times Collection, and receive the first coin in the collection with unique numbering on the edge, ensuring that your set is completely unique. You can order The Winston Churchill Life and Times Coin Collection with confidence knowing that you are fully protected by The London Mint Office’s ‘no quibble’ 14 day return guarantee. Order now and save £20.00 off the normal price, which you can spend on a ticket to see ‘Darkest Hour’ about the great man, which opens in cinemas this weekend.